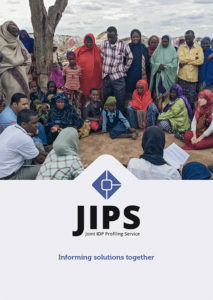 JIPS is an inter-agency service established in 2009 to help governments and humanitarian and development organisations design and implement profiling exercises of displacement situations. Our primary mission is to provide support, either on-site or remotely, in the form of technical assistance, capacity building and training, tools and guidance. Find out more who we are, how we work and with whom in our organisational brochure. The publication is also available in French, Spanish, and Arabic.